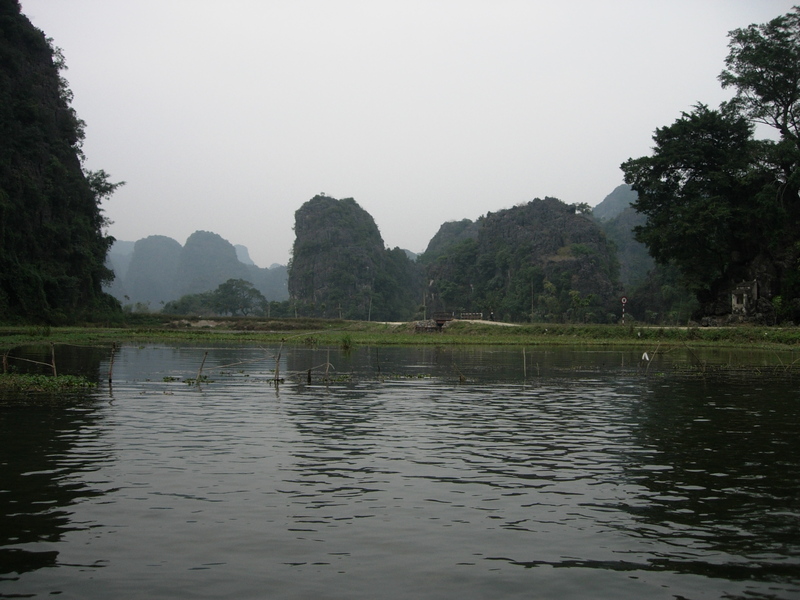 Hoa Lu and Tam Coc made for a great day out from Hanoi. We booked a tour for this one as it was much easier and more time efficient. The mini bus was cramped and I was seated with a young lady from New Zealand who was befriended by Rhoda as she was all alone. Hoa Lu is a small town surrounded by mountains. It would have looked really nice if not for the paved parking lot that was obviously there for the tourist buses. It looked so shabbily made and seemed so out of place in the otherwise tranquil valley. Fortunately, there wasn’t much of a crowd. We took a cemented path passed an archway and on to the two tiny temples. The two temples dedicated to the king and the the queen’s lover were quaint and looked exactly like each other. The difference was that the queen’s statue was turned towards the king’s temple even if she were in her lover’s temple. We boarded the mini bus to head to Tam Coc while the others took off on bikes through the countryside. The trip to Tam Coc took less than an hour and we were deposited to a large restaurant fronting the boat dock that seemed to have been put there to specifically cater to tours. The buffet lunch came with the tour price. The spread was large but the food tasted all the same, especially the fried stuff. With stomachs full, we all gathered at the boat dock where the guide assigned us to the boats. 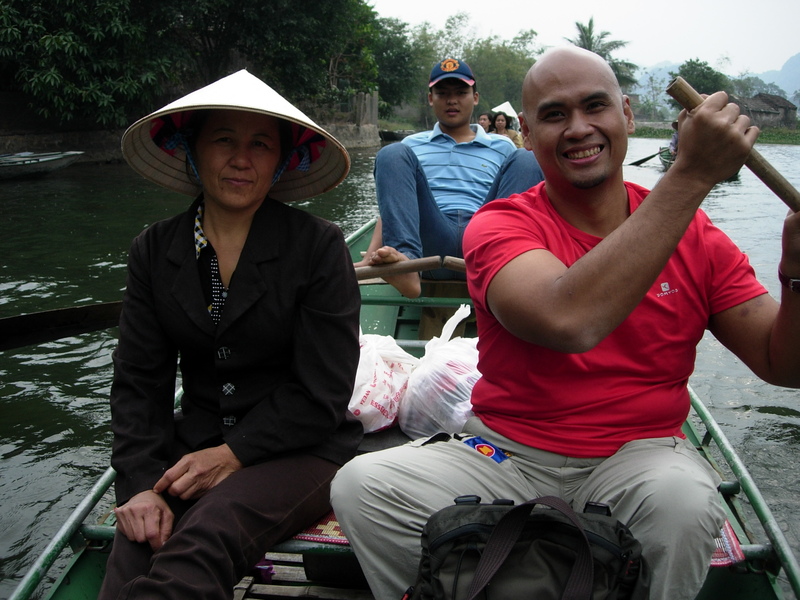 Jeannette and I shared a small boat for the cruise along the Tam Coc river. A middle-aged woman rowed with a paddle while her son rowed with his feet. 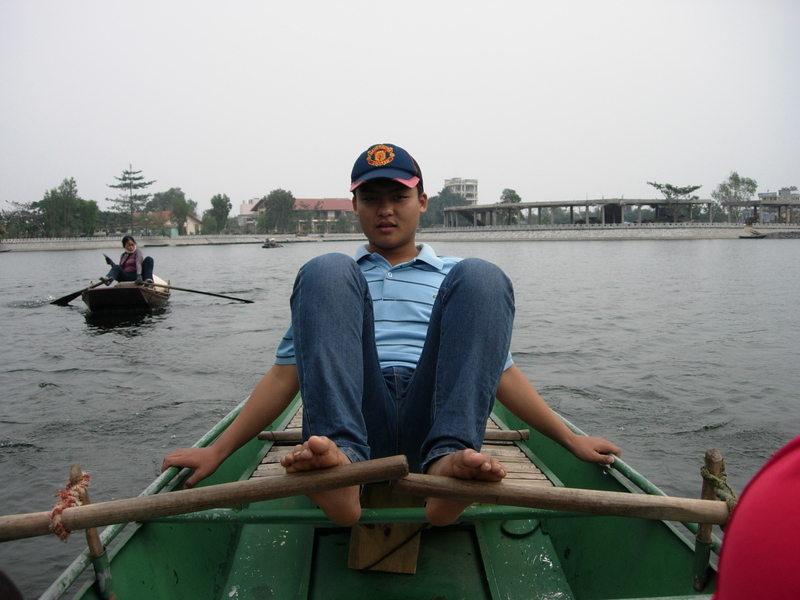 I think the Vietnamese generally row with their feet as I have seen even at the Mekong but the one at Tam Coc was more acrobatic as it involved literally grasping the two oars with the feet and rowing without an engine! He must have really strong abs and back as I can’t imagine the strain it has to put up with. At times, the rower would normally row with his hands. The rice had all been harvested so there was none of the verdant rice fields lining the river banks that look so picturesque in tourist brochures. We did see a few farmers plowing the waist-deep water. 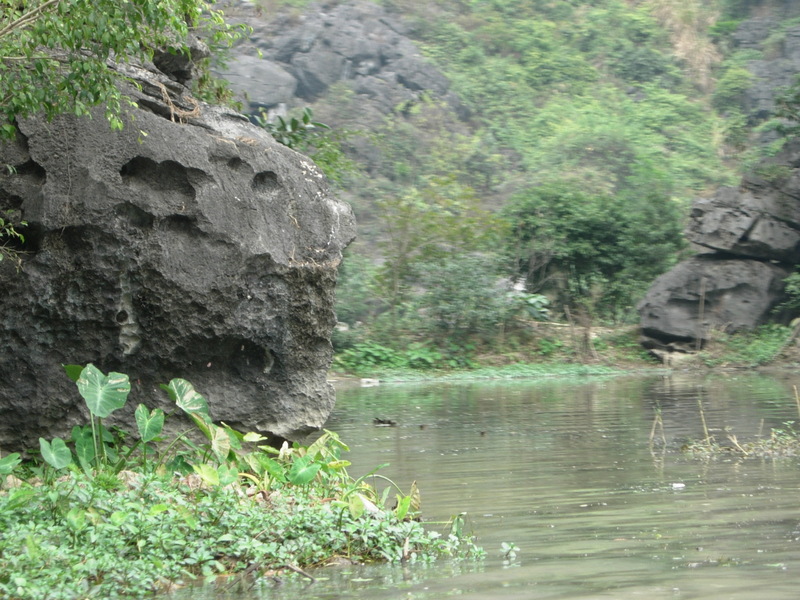 We passed through craggy limestone cliffs and pleasant hills. 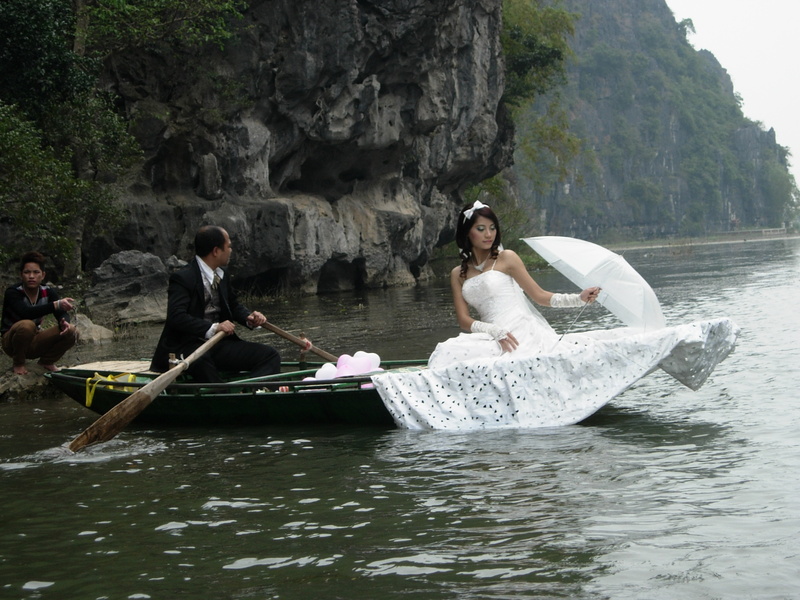 It’s a stretch of the imagination though to call it “Halong Bay on land,” as all the tourist literature do. 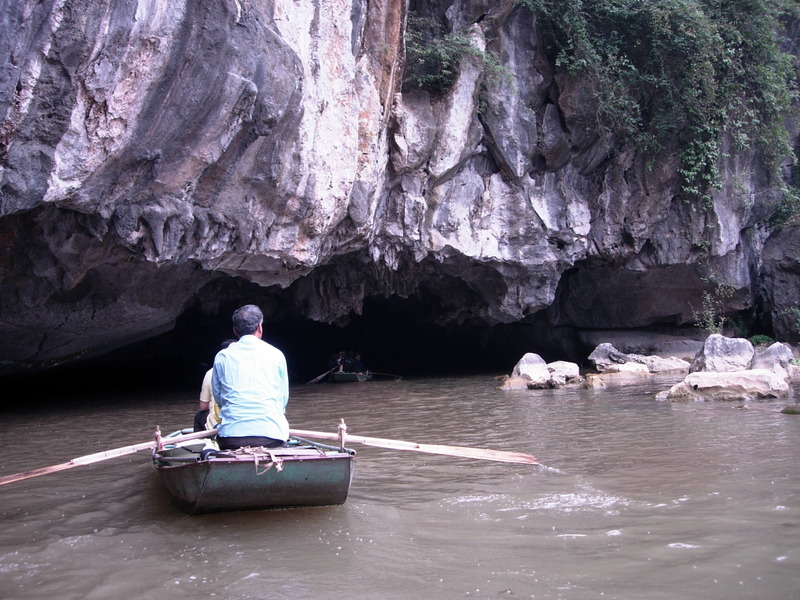 We passed through three caves and at the last cave the river had been fenced off perhaps to prevent the boats from going further. We made a u-turn and this is where all the fun began. Step 1: Establish rapport with them by telling stories about your family. If they are Asian, acknowledge how you are both similar. Since I had pointed out to her that Jeannette had always been mistaken as Vietnamese and they could pass on as sisters, I had unwittingly opened myself to Step 1. Step 2: You are not merely selling someone else produce. You are selling something you made yourself even if it obvious that the t-shirt came from some factory or the blanket your selling looks exactly like the one that is being sold by the other boat. I heard some rustling behind me and lo and behold! Our boat had turned into a mini souvenir stall with t-shirts, blankets, table cloths, and embroideries. We did buy some embroidery because they were really pretty and quaint and Tam Coc really is known for its embroidered pictures. Jeannette bargained hard and we got ourselves a good deal. It was all in good fun anyway as we kept laughing all along and in fairness, “Mother” wasn’t very persistent by Vietnamese selling standards. We were lucky as “Mother” never resorted to Step 4: Don’t let them off the boat if they don’t buy. We did see some boats parked along the banks with the rower persistently selling to the harassed occupants. We never stopped or even slowed down as we made our way back. Perhaps “Mother” with her cunning ways had already psyched us out as being softies. Don't be fooled by this woman. Beneath her quiet demeanor is a cunning saleswoman. As we arrived at the dock, “Mother” asked for a tip. I jokingly said that I’d give her a tip but she has to return the biscuits and drinks we bought for her and her son from one of the boat vendors past the last cave. We gave her 15,000 to split between the two of them. It was a pleasant experience really in spite of being “hostaged” to buy something. Given that kind of situation I think the best way to deal with it to simply do so with a smile, banter while you bargain, and not let it ruin the entire experience. Such was not the case with Julie and Eva whom we had to “rescue” her from their rower who did bring them back to the dock but wouldn’t let go until Julie bought a shirt. She was all frowning and had turned a bit rude. When she asked for a tip we simply turned our backs and fled! In the meantime, I have to find a wall where I can frame and hang my 5 mini embroideries.